Museum working hours during Holidays! Starting from 18 October the museum “Riga Art Nouveau Centre” invites visitors to the exhibition of jewellery artist Aigis Auders named “Nature and Decorations”. Similar to the Art Nouveau period, also today there are artists who want to grasp the multifaceted beauty of nature in jewellery. Aigis Auders gains his inspiration from both common and uncommon forms and textures of nature. 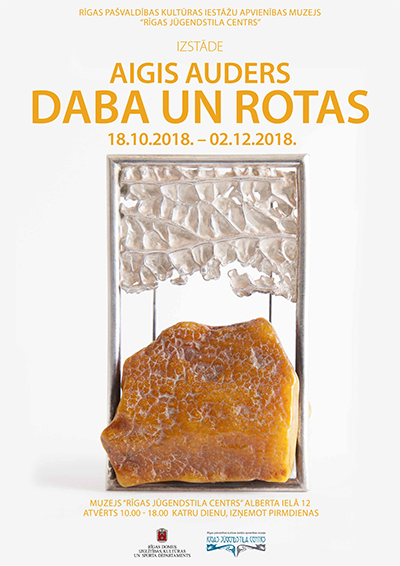 The jewellery created by the artist embodies various elements of nature bound in various compositions, such as entwined fine roots, various objects polished by the sea, fruits of the forest and various items from nature highlighted with the Latvian jewel – amber. 3 February 2019 was the 150th anniversary since the birth of Latvian-German painter Johann Walter (1869–1932). Revealing some aspects of his abundant artistic legacy, the exhibition “House Concert” at the Riga Art Nouveau Centre is a homage to the alliance of painting and music in Walter’s art and life where the violin since his early youth had similar importance as the palette and brushes.